Through the Aramco Teachers to Saudi Arabia Program, Saudi Aramco invited educators on a sponsored tour of Saudi Arabia in an effort to increase knowledge and understanding of Saudi Arabia, its culture and values. In coordination with the Institute of International Education, U.S. teachers and media specialists were selected to travel to Saudi Arabia for a fully funded, 10-day study tour focusing on education, industry, culture and Saudi – U.S. relations. Throughout the tour, participants will meet with experts in these areas as well as visit elementary and secondary schools, areas of cultural and historical significance, and modern industrial facilities throughout the Kingdom. The IIE delegation of U.S. teachers arrived at Steineke Hall enthusiastic, happy, and very tired. 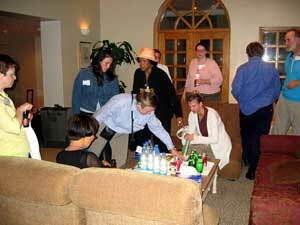 The International Public Relations employees came to welcome them and provide refreshments after their long trip. Saudi Aramco is a fully integrated petroleum enterprise and the global leader in the discovery, exploration, production, refining and distribution of petroleum products. It employs approximately 54,000 people globally representing 56 different nationalities and maintains 8 self-contained residential areas across Saudi Arabia including communities in Dhahran, Ras Tanura, Abqaiq and Udhailiyah. Saudi Aramco is headquartered in Dhahran, a Saudi Aramco community that sits between Damman and Al-Khobar, Saudi Arabia in the Eastern Province. 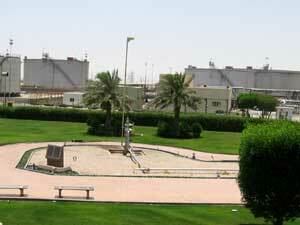 The discovery of oil transformed Dhahran from a desert oil camp in the 1940s to a modern city. While visiting Saudi Aramco's headquarters and neighboring cities, guests stayed at Steineke Hall, a modern cement brick structure built in 1952 and named after the pioneer geologist Max Steineke. Max Steineke is credited for his determination to find oil which lead to the discovery of oil in commercial quantities in Saudi Arabia. His name is preserved at Steineke Hall. 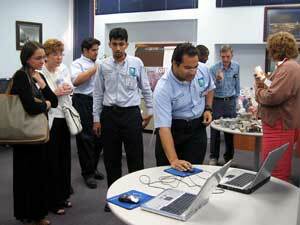 Guests were invited to tour the Saudi Aramco Exhibit, a state-of-the-art facility dedicated to energy education. It is Saudi Arabia’s first major science museum featuring the history of Aramco, oil and gas operations, and the history of Arabic-Islamic technology. The exhibit is a fascinating journey through history from petroleum’s origins in the ancient seas, through underground rock formations and desert drilling operations, into refineries and marine shipping terminals. The Oil Exhibit was established in the 1950s with the latest upgrade completed in 2000. It now incorporates state-of-the-art technology that provides automated and computerized exhibits for hands-on learning about the perpetual and fast-paced development in the oil and gas industry. While at the Saudi Aramco Exhibit, guests were received by Khalid I. Abubshait, General Manager, Government Affairs and Nasser A. Al-Nafisee, Manager, Public Relations Department during a brief reception. Mr. Abubshait expressed his pleasure on meeting the teachers and said that he was impressed with their objectives of building "Bridges of Understanding" between our two cultures. The tour commenced with the viewing of the magnificent 3D Film - Energy to the World, followed by a company overview presentation, then guests were escorted through the exhibit. 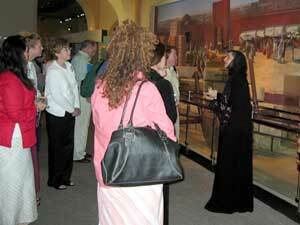 Guests were then given an informative tour through the oil exhibit by Saudi Aramco employee Manal Al-Hazza. The Arabic and Islamic Technical heritage display is the centerpiece of the exhibit, narrating the scientific tradition in which the modern petroleum industry is founded. To develop this display, Saudi Aramco consulted with internationally renown Islamic scholars and gathered photographs of medieval scientific manuscripts including hand-drawn illustrations which are displayed in the exhibit. For the opening display, marine biologists and geophysicists partnered with chemists and engineers to develop a user-friendly look into the origins of oil and gas. Staff writers were intimately involved in the project, translating technical terms into simple language for the museum's hundreds of Arabic and English labels, display panels, and exploratory signs. Enriching all areas of the exhibit, computer-generated videos and interactive games help children explore the panoply of forces -- from the Big Bang to the mollusk -- that have made petroleum the driving force of the world. By visiting a simulation of Saudi Aramco's state-of-the-art Operations Control Center or stepping into a life-size model of a shipping vessel's control room, children and adults alike can experience the exhiliration of discovering, harnessing, and distributing energy to the world. As part of the tour, guests were taken to Dammam Well Number 7, where, in 1938, American owned Standard Oil Company of California (SoCal) made the first oil discovery in Saudi Arabia marking the first in what would become many spectacular accomplishments in the history of Saudi-U.S. cooperation in oil exploration. It took five years of pain-staking work under extreme desert conditions before the well now known as Dammam Number 7 hit oil in commercial quantities. The discovery of oil transformed Dhahran from a desert oil camp in the 1940s to a modern city, and is now the site of Saudi Aramco’s headquarters. Following the tour of the Saudi Aramco Exhibit, guests visited Saudi Aramco’s Exploration and Petroleum Engineering Center (EXPEC). After visiting EXPEC, guests were treated to a lunch hosted by Khalid I. Abubshait. Next on the itinerary, guests visited Saudi Aramco's Leadership Center where they received an overview and presentation on the numerous career development programs supported by the company. Saudi Aramco's recognition of the importance of ongoing education in the workplace is apparent in it's operation of one of the largest industrial training programs in the world. Employees are encouraged to seek educational opportunities supported by the company to upgrade their professional and vocational skills. The company offers E-Learning on-line computer courses as well as classes taught by highly-skilled professionals in one of many Aramco Industrial Training Centers (ITC). For advanced training, it is not uncommon for employees to be sent to top-ranked training institutes overseas or to be sponsored on short-term learning assignments at other leading companies abroad. The ASTC "Speak-up Club" delighted the group with a very entertaining and informative short exposé on their hometowns in Saudi Arabia. The evening air was lovely and warm as the guests dined outside on the patio of Café Najjar. 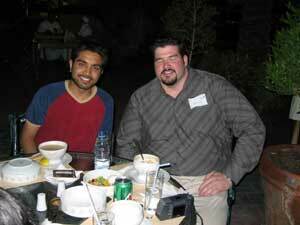 During dinner, high school teacher, Jerome Hoynes from Glenbrook North High School, met his friend Saif Siddiqi, a student from the University of Illinois at Chicago. They became acquainted at a Model UN conference held in Chicago. Saif, the leader of the conference, and Jerome, a Model UN advisor, who escorted 32 of his high school students to the Model UN, started talking about Saudi Arabia. Jerome told Saif he would love to come to Saudi Arabia, never expecting he would ever have the opportunity. According to Jerome, Saif is an impressive representative of Saudi Arabia. During a conversation, he told Jerome that “Aramco is like my family.” Only now does Jerome understand how Aramco is one big family of all nationalities.